The stunning and fun city of Nice has long been the de facto capital of the Riviera. It has a population fast approaching 350,000 people and is very multi-cultural. It has swapped hands many times in its history and only joined France in 1860. On top of the resident French, Italians, Swiss and Brits, expect to find a whole host of people from around the world who have made this city their home. It's a great place from which to explore the rest of the Côte d'Azur, not to mention nearby Monaco. You could even take one of the frequent ferries across to Corsica. Although, with so much to do in the city itself you may not get the chance. The majority of Nice's beaches are pebbled, but don't let that put you off. The sea is very tempting, being warm and clean. Unlike its more elderly neighbours of Menton and Cannes, Nice is a very youthful and energetic town and is very popular with backpackers. Don't come here if you are merely looking for a relaxing place to stay! Alongside its charming old town, Nice boasts an opera and many bustling markets. If you want to escape from the sun and indulge your mind instead, then you'll be pleased to know that Nice has enough museums to keep you occupied for a lifetime! From London you can take Rail Europe straight down to Nice. Another option is to catch France's fast and efficient TGV train service to Marseille after passing through the channel Tunnel. Flying into Nice is easy as the town has its own airport - the trip takes around two and a half hours. 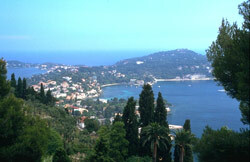 Nice is an expensive and affluent town and so expect property prices to be high. The best value properties in Nice are to be found north of the railway station. Brand new homes are in demand and there is a lot of land in the west of the town awaiting development. A large number of properties will have a swimming pool. Resale of properties has risen steadily by about 8% each year. Do you know Nice better than we do? Do you have photos of Nice? On the coast of the Alpes-Maritimes department - close to the border with Italy. Access: The town has its own airport with regular flights to and from the UK. Economy: Catering for the many tourists who arrive every year provides the main industry.